Azure waters. We could see the base of the Mediterranean Sea even from halfway above the hiking route. We stayed in Montorosso Al Mare, which happened to be the first of the villages in our journey from the French border via Aosta & Torino. We were surprised to land among swarms of people even in the month of May, many of them tourists out for a weekend of sun and sand. Montorosso, perched upon the azure water. The other villages are 2 hour hikes away, through narrow mountain paths cut into steps. That’s perhaps the best way to get an aerial view of the perched villages, but we chose the 10 minute train route instead. According to both lonely planet & wikitravel, Vernazza is the most picturesque of the 5 and hence also the most commercial. It was hard to look beyond the crowd and validate this claim. More people than mountains or water at Vernazza. Riomaggiore was a breathe of fresh air in comparison, and from here it’s easy to see, even on land, how a large part of the village is perched upon a stretch of land arising out of the water. On the bus ride to Porto Venere, another small town by the riviera, we realized that the perched landscape is almost typical of the Italian riviera. Cinque Terre‘s claim to fame is really the hike between the villages, which took farmers a thousand years to carve amid the mountains. Porto Venere has the ruins of what seems like an old fort and cathedral by the Mediterranean Sea. The architecture is as beautiful as the landscape, as elsewhere in Italy. It’s touching to think of the amount of effort and warmth that goes into anything that’s made in Italy and France (and probably elsewhere in europe). Porto Venere. An old cathedral & fort by the Mediterranean Sea. Despite it being my first visit to Cinque Terre, I can imagine the serene beauty of the villages sans the tourism. I wish we could find a way to restore the original charm and typical life in the region. Cinque Terre is beautiful. Amazing how those structures can rise above a small piece of land. I agree that to much tourist ruins the old charm of any natural attraction. Boracay was once like that but now there’s hotels everywhere, too congested. You have to go off season to enjoy it’s pristine beach, or you can wake up at dawn and just sit by the seashore waiting for the sun to greet the day. Thank for the nice comment. I should’ve done the waking up at dawn at Cinque Terre but the body clock wouldn’t allow it! Hence the need for off-the-beaten-track places and taking a leap of faith to explore them. I have been to Cinque Terre in the off season and it is fabulous. The best way to see these towns is by boat. Looking into them from the sea is incredible. We have a house in Bagni di Lucca, about 2 hours from Cinque Terre and Portovenere (my favourite) and go as often as we can when we are in Italy. I hope you get to go back when it is not ful of tourists. Having a house by the Italian riviera sounds so lovely 🙂 I hope I get to go back and see it without the swarms of people! Hi, i believe that i saw you visited my web site so i came to go back the want?.I’m attempting to to find issues to enhance my web site!I assume its ok to use some of your concepts!! Hi Shivya . I have been to Cinque Terre and taken the trek route . I’m hearing that they are planning to put a cap on the number of tourists that can visit this place. Hi, this post made me so excited! 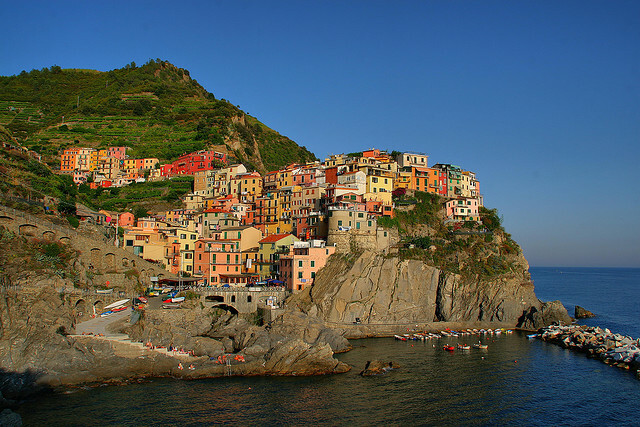 I will be visiting Cinque Terre sometime in the next two weeks! Is there a hidden spot of peace or serenity in the area that you found? That is away from the masses of people and tourists? My goal is to experience the area as authentically as possible. Thanks! hey did u visit these villages ? some guided tour or on your own ? Previous PostFrom Italy With Love. Next PostReflections on Lake Garda.